Students - This is the second time this week that I've written from a photograph. On Wednesday, I wrote from that wonderful barn roof near my home, and now this! Today's poem was inspired by Poetry Friday writer and artist Diane Mayr's photograph above, MURPHY'S FIX, and both are a part of SPARK 17, a project I take part in regularly, a project generously hosted by Amy Souza here. Anyone is welcome to participate. Simply read and learn about it, and you can sign up for SPARK 18 with a chance to swap your own writing, music, or art with someone else. I lived with Diane's photo in my head for a few days before I decided what poem to write. 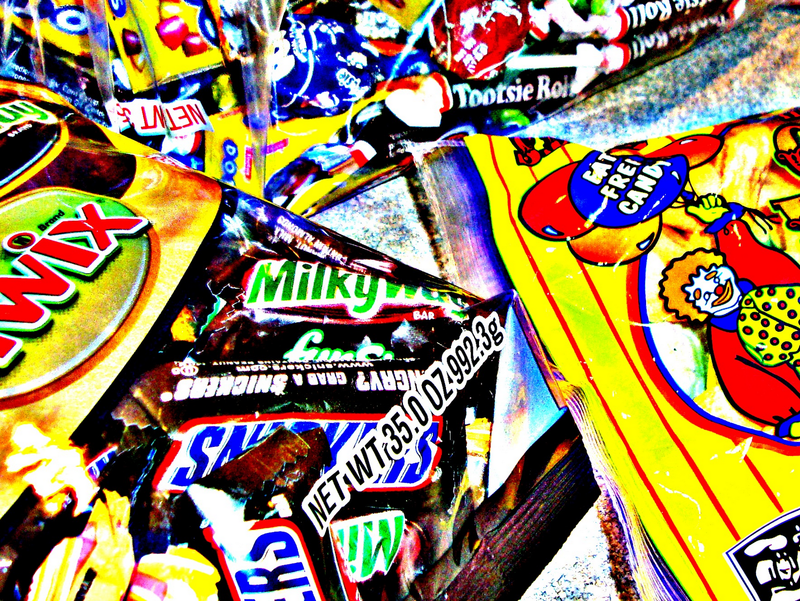 The colors and variety of candies just got to me, and every once in a while I would see them in my head. Should the poem be about candy wrappers stuffed in my car pockets and coat pockets and on this very desk? No. Should the poem be about how I can chew a whole pack of gum in less than an hour and not even feel badly about it? No. The poem should be about Halloween night, every Halloween night....when my sister Heidi and I would spread our candy out and trade and laugh and eat the hours away. You may be wondering why this poem is about a boy and a girl when my personal memory is about two girls. Well...I wanted to make the poem about a brother and a sister...and so I did. I have nephews and a son and love including both genders in poems when I can. Today's poem is partly a list poem. You can see that there are places that are simply lists of candy names. I am quite sure that I did this because this week I just kept reading Kenn Nesbitt's book I'VE SEEN MY KITCHEN SINK, and I giggled at the list of foods in his poem, My Special Diet. I also thought about Jack Prelutsky's Bleezer's Ice Cream and Shel Silverstein's Sarah Sylvia Cynthia Stout, both poems with food-filled lists. It's quite fun to make a list of rhyming foods, and it's not too difficult. Try it sometime, even just in your notebook. Real foods OR make-believe foods. When I asked Diane Mayr about the photograph above, she replied, "It's just candy for a funeral lunch. In honor of the departed mother of a dear friend. (Cross my heart and hope to die, it's the truth.) I just took a photo of the candy before it was put into a bowl. I cropped and manipulated the photo a little." Don't you think it's the most vibrant and wild candy picture? I loved writing from it. It's not Halloween today. I know! But a writer can write and an artist can create about any thing at any time. Yes! Teachers - You might wish to try a modified SPARK project in your own class, or with a class across the hall! If you do, please let me know. I'd love to feature it here. Congratulations to all of the 2012 Cybils judges, especially the ones for poetry. You can see a complete list here (full of many names you know and love)...and follow their tweets and updates as the books come rolling in. Please send your nominations between October 1 - October 15. This week over at my other blog, Sharing Our Notebooks, I am so happy to welcome Barry Lane. Teachers - Barry has offered a generous giveaway of two of his books about writing and a CD, and the drawing will take place on September 30. This week, I have finally linked all of the wonderful Poetry Peeks from this blog into one index. If you are looking for some inspiration, student mentor poems, or ideas for ways to bring more poetry into your classroom, don't miss this new index. You will permanently find it in the tabs up top. I had to smile when I saw Renee's Poetry Friday roundup today over at No Water River. She's hosting us with candy. Quinkidink! Head on over to enjoy all of the goodies she has spread before us. Addition: This afternoon I received a special poem from a second grader, and it warranted its own Poetry Friday post. Click here to read it! Hey, Tootsie (roll), I'll be sure to fly up to the Milky Way so I can Snicker with you for a Twix. Oh the words from candy make the memories, don't they? You are right, it is a most vibrant picture. And the poem is exactly the way I did it too, a long time ago, only with a friend. Thanks Amy. Thanks, Amy, for the fun poetic adventure (Spark #17) we shared this past week! I usually write from photographs or pictures, but in Spark, I'm stretching myself to make pictures from others' words. "hypnotized by rows of treats" sounds about right! I enjoyed seeing the interplay of photo and imagination. Spark is well-named! Now THIS is a perfect poem-lovely rhythm, fun sounds and imagery a great ending- and sweet to boot! I love it, and I eagerly await Forest Has a Song. Congratulations!! Today's Poetry Friday is just TOO SWEET all around! Diane's picture is great - and what an interesting source! 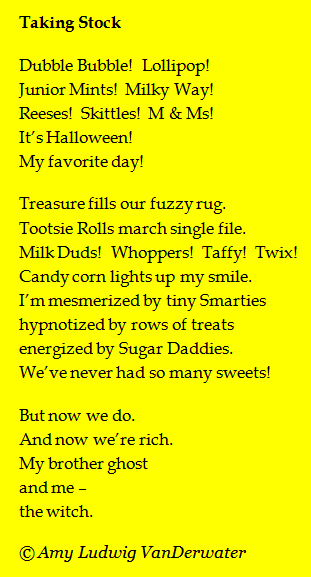 - and your poem also takes me back to my childhood, spreading out our Halloween loot across the floor. Nice twist at the end there, Amy! I think we an all identify with this one. 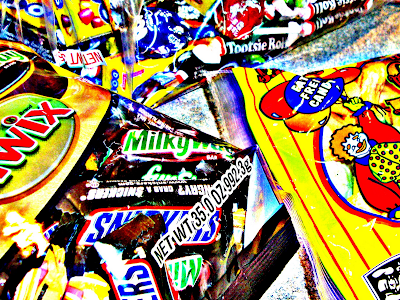 I like the photo and the poem, and I think candy should be part of every funeral lunch. So glad you didn't leave out Milky Ways, my favorite! What a fun activity!